Seabourn Cruise Line is an ultra-luxury cruise line headquartered in Seattle, Washington. The line operates all around the world, from short seven-day Caribbean cruises to exotic 100+ day around the world cruises. It is owned by Carnival Corporation, part of the "World's Leading Cruise Lines" marketing group, which also includes Holland America Line, Princess Cruises, Carnival Cruises, Cunard Line, Costa Cruises, P&O Cruises, and AIDA Cruises. Seabourn was founded in 1987 by a consortium of Norwegian investors headed by industrialist Atle Brynestad under the name Signet Cruise Lines, but adopted the name Seabourn Cruise Line shortly afterward after objections from Signet Oil over trademark ownership. Its first ship, Seabourn Pride, entered service in 1988, followed by an identical sister, Seabourn Spirit, in 1989. A third vessel, originally planned for 1990, was delayed due to investors' financial constraints and was ultimately purchased by Royal Viking Line in 1992 as Royal Viking Queen. In 1995, Royal Viking Queen was transferred to a Kloster subsidiary, Royal Cruise Line, as Queen Odyssey. In 1991, Carnival Corporation purchased a 25% stake in Seabourn. Carnival Corporation upped its stake to 50% in 1996, providing the company sufficient capital to purchase the Queen Odyssey, which was then renamed Seabourn Legend. During that time Seabourn was known to be a trendsetter in ultra-luxury cruising, offering a service that was second to none and having won multiple "World's Best" awards i.e. Condé Nast Traveler's prestigious "World's Best Cruise Line" award. In 1998, in partnership with a consortium of a Norwegian businessmen, Carnival purchased the remaining 50% stake in Seabourn, as well as acquiring the venerable Cunard Line from Kvaerner ASA, and merged the two brands into an entity called Cunard Line. In 1999, three Cunard ships, Sea Goddess I, Sea Goddess II, and Royal Viking Sun were transferred into the Seabourn fleet as Seabourn Goddess I, Seabourn Goddess II, and Seabourn Sun. In 2001, Carnival bought out the Norwegian shareholders, and Seabourn's parent company became a wholly owned subsidiary of Carnival. That summer, Seabourn Goddess I and Seabourn Goddess II were sold to Seabourn's original founder, Atle Brynestad, in order to establish his own cruise line SeaDream Yacht Club. In 2002, Seabourn Sun was transferred to the Carnival-owned Holland America Line, reducing the Seabourn fleet to its three original sister ships, and the company was demerged from Cunard Line and reorganized as a stand-alone operating brand of Carnival Corporation & plc. On March 31, 2011, Seabourn moved operations from Miami, Florida, to the Holland America Line quarters in Seattle, Washington. 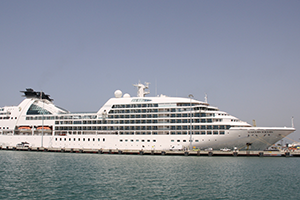 In 2014, Seabourn Pride departed the fleet and was transferred to Windstar Cruises as Star Pride. 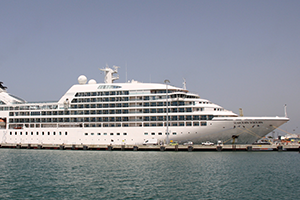 In 2015, Seabourn Spirit and Seabourn Legend departed the fleet and was transferred to Windstar Cruises as Star Breeze and Star Legend. In August 2018, Seabourn announced it would take its first ever cruise to Cuba in late 2019. The company's fleet currently consists of five vessels, with two sets of sister ships. 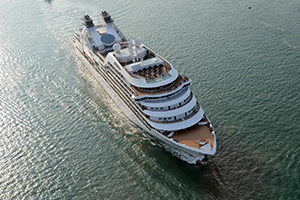 The fifth, Seabourn Encore, was launched in 2018. In October 2006, Seabourn ordered three new, 32,000-ton luxury cruise ships from Genoa's T. Mariotti shipyard. The first, named Seabourn Odyssey entered service in 2009, followed by the Seabourn Sojourn in 2010 and the Seabourn Quest in June 2011. The three ships share most features. The Odyssey, Sojourn, and Quest have a maximum passenger capacity of 450 guests, quartered in 225 suite cabins, 90% of which have a balcony. The 650-foot (200 m) vessels cost approximately US$250 million each. The ships have 11 decks, an 11,500-square-foot (1,070 m2) indoor/outdoor spa, and four alternative dining venues. 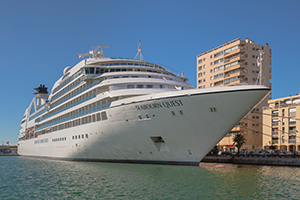 It was announced on February 19, 2013, that Seabourn reached an agreement with Windstar Cruises for the sale of the three smaller Seabourn ships. Seabourn Pride departed the fleet in April 2014, sisters Seabourn Legend & Seabourn Spirit departed in April and May 2015, respectively. No cruises were canceled as the ships sailed with Seabourn until their initial dry dock periods. 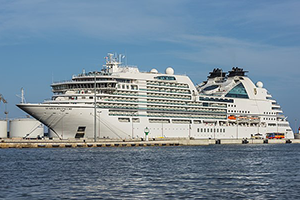 On October 18, 2013, Seabourn announced it had signed a Letter of Intent for the construction of a new ultra-luxury cruise ship with Italian shipbuilder Fincantieri. The new ship was modeled after the line's three newest vessels, Seabourn Odyssey, Seabourn Sojourn and Seabourn Quest. Delivery was completed in 2016. The vessel replaced the capacity that left the Seabourn brand with the sale of Seabourn Pride, Seabourn Spirit and Seabourn Legend. In July 2018, the cruise line announced it would add two expedition ships to its fleet, which are expected to enter service in June 2021 and May 2022. Seabourn Odyssey. Built: 2009. Gross tonnage: 32,346 tons. Seabourn Sojourn. Built: 2010. Gross tonnage: 32,346 GRT. Seabourn Quest. Built: 2011. Gross tonnage: 32,348 GRT. Seabourn Encore. Built: 2016. Gross tonnage: 40,350 GRT. Seabourn Ovation. Built: 2018. Gross tonnage: 40,350 GRT. Seabourn Venture. To enter service: June 2021. Gross tonnage: 23,000 GRT. First Expedition cruise ship for Seabourn. TBA. To enter service: May 2022. Gross tonnage: 23,000 GRT. Sister ship to Seabourn Venture. The Sojourn was awarded "Best Newcomer of the Year – Silver" from the European Cruiser Association in 2010 while the Quest won the gold award in the same category in 2011. Seabourn was voted "Best Small-Ship Cruise Line in the Conde Nast Traveler Readers' Choice Poll in 2008 and 2010. The line was also voted the "World's Best Small-Ship Cruise Line" in the Travel + Leisure magazine readers' poll in 2007, 2009, 2010, 2011 and 2012. In addition it has been named to Conde Nast Traveler's prestigious "Gold List" of top hospitality venues for 17 consecutive years.